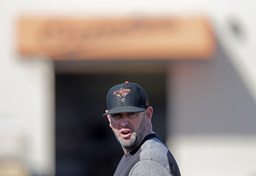 SARASOTA, Fla. (AP) The Baltimore Orioles have many jobs up for grabs, and nowhere is the competition less defined than in the infield. As the team held its first full-squad workout on Monday, only one infield position is secured - first base. Chris Davis is entering the fourth year of a seven-year, $161 million contract. Besides Davis, there are 13 players on the roster competing for the three starting positions, and a utility job or two. Davis, like the Orioles, had a horrid 2018 season. He hit just .168 with 16 home runs and 49 RBIs and 192 strikeouts in 128 games as Baltimore lost a franchise-record 115 games. There aren't any clear favorites early on. The Orioles obtained Jonathan Villar in their July remake from Milwaukee and he played both second and shortstop over the season's last two months. Villar was originally labeled as a shortstop by new general manager Mike Elias, but that was before Richie Martin was taken with the first overall pick in the Rule 5 draft. On Saturday, the Orioles signed veteran Alcides Escobar to a minor league deal. Escobar, who played 162 games in 2014, 2016 and 2017 for Kansas City, won the Gold Glove at shortstop in 2015. He's not scheduled to report until Tuesday. Manager Brandon Hyde is pleased with the addition of Escobar. "I think it just creates the competition going in camp," Hyde said. "Excited about the mix of middle infielders we have. It's just a guy that's been there that has nine-plus years playing defense in the middle of the field at the big league level. To add competition is always a good thing." Baltimore has another Rule 5 pick in camp, Drew Jackson, who was from the Los Angeles Dodgers organization, and selected by Philadelphia. The Orioles immediately traded with the Phillies for Jackson. "We're just all out here trying to win a job," Martin said. "Whoever plays the best - simple as that - wins a job." It's no small group competing. The incumbent third baseman is Renato Nunez, who was added to the team last July after shortstop Manny Machado was traded to the Dodgers. Nunez hit .275 with seven home runs and 20 RBIs in 60 games in the second half of the season. In his first major league acquisition, Elias claimed left-handed hitter Rio Ruiz on waivers to compete with Nunez at third base. Elias also claimed Hanser Alberto on waivers from Texas, and he inherited Steve Wilkerson, who can play multiple positions. Wilkerson jokingly said he brought 10 gloves to spring training, and he'll likely compete for a utility job. "I get my work in at every position almost every day," Wilkerson said. "I work on the abnormal plays and the web gems. One of my favorite things to do is dive for a ball and work on making a play that might get me on TV or something." Non-roster infield candidates are Jace Peterson, who played 93 games at seven positions, including an inning on the mound, Chris Bostick, Jack Reinheimer and Zach Vincej, all of whom played in the majors last season. Rookie Ryan Mountcastle, who's one of the team's most highly touted prospects is also in camp. Mountcastle played third base for Double-A Bowie a year ago, and he's not considered a candidate for a major league job yet.